CaM mediates many crucial processes such as endoplasmic reticulum, and the sarcoplasmic reticulum. CaM can undergo post-translational modifications, such as phosphorylation, acetylation, methylation and proteolytic cleavage, each of which has potential to modulate its actions. Calmodulin is a small, highly conserved protein approximately 148 amino acids long (16706 Daltons). It contains four EF-hand motifs, each of which binds a Ca2+ ion. The protein has two approximately symmetrical globular domains each containing a pair of EF-hand motifs (the N- and C-domain) separated by a flexible linker region. Calcium participates in an intracellular signaling system by acting as a diffusible second messenger to the initial stimuli. Up to four calcium ions are bound by calmodulin via its four EF hand motifs. EF hands supply an electronegative environment for ion coordination. After calcium binding, hydrophobic methyl groups from methionine residues become exposed on the protein via conformational change. This presents hydrophobic surfaces, which can in turn bind to Basic Amphiphilic Helices (BAA helices) on the target protein. These helices contain complementary hydrophobic regions. The flexibility of calmodulin's hinged region allows the molecule to wrap around its target. 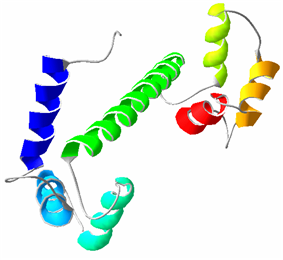 This property allows it to tightly bind to a wide range of different target proteins. Compared to the X-ray crystal structure, the C-terminal domain solution structure is similar while the EF hands of the N-terminal domain are considerably less open. The backbone flexibility within calmodulin is key to its ability to bind a wide range of targets. ^ Stevens FC (1983). "Calmodulin: an introduction". Can. J. Biochem. Cell Biol. 61 (8): 906–10. ^ Chin D, Means AR (2000). "Calmodulin: a prototypical calcium sensor". Trends Cell Biol. 10 (8): 322–8. ^ Chou JJ, Li S, Klee CB, Bax A (November 2001). "Solution structure of Ca(2+)-calmodulin reveals flexible hand-like properties of its domains". Nat. Struct. Biol. 8 (11): 990–7.